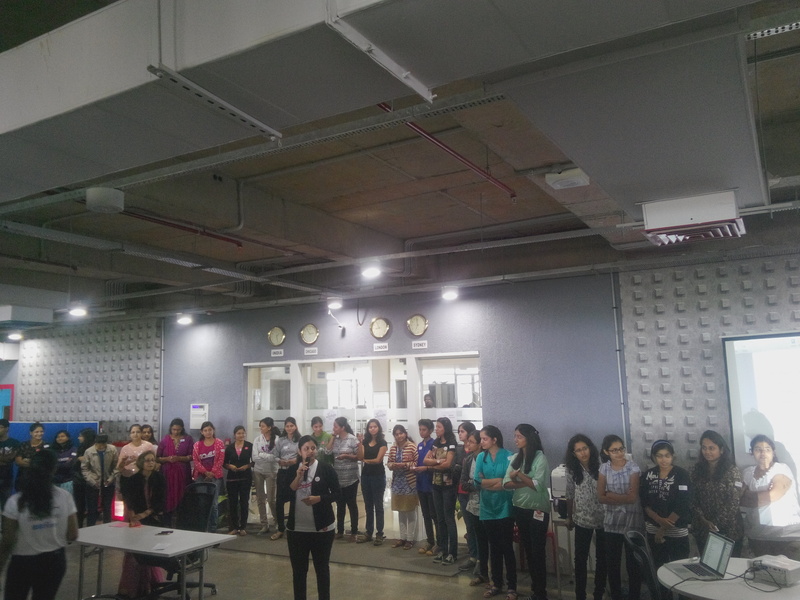 Rails Girls, Pune was conducted on December 13, 2014 at ThoughtWorks, Pune. The event kicked of at 8:00 am which was too early on a chilly winter day. The introductions/ keynote by Gautam Rege, Rajshree and Pooja covered a brief introduction to Ruby, Ruby on Rails and of course the event ‘Rails Girls’. After that there was a video where the ThoughtWorkers had taken an extra effort to enact and let the attendees decide their track- Beginner, Intermediate and Advanced . Though the video was enacted well by TW folks but IMO, it did not serve the purpose rather confused some attendees whereas last year, there were random groups being formed while I was an attendee then and this time a volunteer. Volunteers helped the attendees to decide groups, installations and setup to get started as it was going to be a hands on workshop the whole day. Though there were arrangements for breakfast but only few girls could take it because of the early schedule and they walking in late. So, the agenda of the day was to introduce the participants to Ruby, Ruby on Rails and help them build a small web application by the end of day, so that they see something substantial and feel proud about what they did throughout the day. We were all set to start, the attendees have grabbed their round tables. Each group of 4-6 girls(mostly) was accompanied by a pair of coaches where a beginner coach was paired up with an advanced coach. After everyone settled in their groups, the coaches introduced ruby as a programming language to the group. Some of them asked the attendees to use tryruby.org while others used irb(Interactive Ruby Shell). It was good to know that people who have been using C, Java till now were happy to meet Ruby and found it magical. So there was a brief introduction to rails as going forward, the attendees were expected to make a rails application and show case at the end of the day. At 11:30 am there was a talk by a team from Team Vision where they spoke how they understand and code without being able to see. The talk was inspiring as well as motivational, people who cannot see are able to code then what is stopping others from doing that. After that, there was a small activity named Bentobox where attendees were given stickies and a list of technology name and asked to put them in the right section so that they can have a better understanding of Front end technologies, Storage, infrastructure and others. After this 15 minutes activity, the coaches briefly explained the Bentobox to their respective groups. The Bentobox activity was followed by lunch after which there was a stress busting Origami session. It was taken by a retired lady teacher with a passion for Origami. To split the girls into groups of six, everyone was asked to stand in a circle and then pick up chits which had some keyword written on it. Now, each one was supposed to find others with the same chit and form groups of 6. Here we were checking in reality how much noise could the girls make while yelling out for theirs partners. Being a volunteer, I stood beside and enjoyed the view 😀 After everyone was successfully in groups of 6, now we started with some paper folding and each piece was to be added to make a colorful cube, which was again an encouraging group activity. After this stress busting activity, everyone was back to work and started working on their apps. Now there was more focus on Rails and building the apps. All the coaches discussed with their groups regarding which web application they would like to make. All the web applications were basically a CRUD(Create, Read, Update, Delete) but with a different wrapper to it. Those who could complete their apps on time, deployed on heroku while there were some who faced problems in deploying to Heroku. Later, was the showcase time where people came down to demo their application and share their experiences. Some of the attendees looked very happy and proud of what they have done since morning. People had take away which was a proud moment for all the coaches who did the hard work the whole day imparting knowledge to a bunch of people. One of the interesting apps a participant made was Boyfriend Expense Management App. Next, there was cake cutting ceremony and a closing keynote. T-shirts were distributed at the end of the day, those who left early missed the yummy cake and t-shirt and hence another Rails Girls, Pune came to an end for the participants but not for volunteers/coaches/organizers. A meeting was scheduled for feedback which was very organised I felt but too time consuming. We looked at what went well through out the day, what we could improve and what was different from the last time. From being a participant last year to a volunteer this year, I could see that there were less interactions among girls this time, mainly the ice-breaker was missing. The event was a success in all. The day ended with a team dinner and a bit more interactions with people from the organizing team. You can check out the Rails Girls video here which summarizes the event well 😉 .